A nasty hangover can ruin the following day. Follow these tips and you`ll be back at the bar by 2pm. 1) Before going to bed drunk, drink as much water as possible. 2) Take Aleve, Tylenol or any powerful aspirin in the morning. 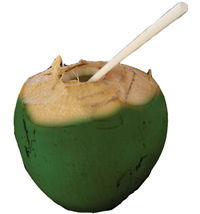 3) Drink some coconut water the next morning. 2 coconuts if you are normal sized, 1 if you are short, 3 if your nickname is Shrek. 4) A beef pastel (fried wonton) or a picanha burger (rumpsteak) with fries is just what the doctor ordered. 5) Jog and sweat it away. What better place to do it than the beach bike path (for joggers too). 1) Don`t drink caipirinhas made on the street… they tend to use unfiltered ice. 3) Before going back to the hotel, throw down a steak sandwich from Lamas or Cervantes (check page 130). I have no idea if this works, but it sure tastes good. 4) Ask for premium cachaça mineira or vodka when ordering your caipirinha. The cheap brands are not as filtered or selectively distilled. 5) A shot of olive oil before drinking will help you win any binging competition…really! 6) Cut yourself off after 17 caipirinhas… I mean, you gotta have limits, man!